A corrupted Outlook database trashes your e-mail archive and contact list. An accidentally deleted folder wipes out critical business documents. A sudden hard-drive failure destroys your MP3s and photo libraries. The list of potential catastrophes goes on and on, and few users are prepared to deal with them. That's because they lack a diversified backup plan. From a certain point of view, data is a little like money. Financial advisors always recommend maintaining a diversified portfolio, the idea being that if one stock or mutual fund tanks, you won't go broke. The same concept applies to backups: By diversifying your approach--that is, archiving your data in multiple places using multiple methods--you're safe even if disaster strikes one location or collection of data. Let's take a look at the ways you can expand your backup portfolio to protect against the inevitable data catastrophe. To ensure the safey of your important files, I recommend using at least a few of the following methods in unison. With external 500GB hard drives readily available for as little as Rs 5K, there's no reason not to keep one plugged into your PC. Pair it with a drive-cloning utility like Macrium Reflect Free, which can perform scheduled, incremental backups with or without compression. 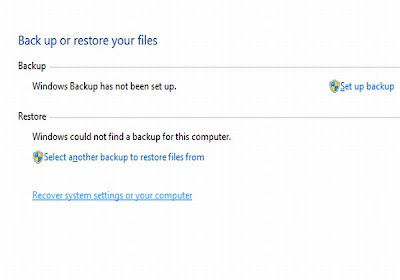 A full-system backup to an attached drive is your best line of defense against data loss: In the event of total failure, it's a simple matter to restore every bit and byte to a replacement drive. While it's great to archive your entire hard drive, don't overlook the benefits of backing up just your critical data: documents, bookmarks, financial records, e-mail, address books, and so on. Why bother? Simple: Sometimes you just want to restore a handful of files or a select chunk of data. Plus, data-only backups take a lot less time than full system backups. 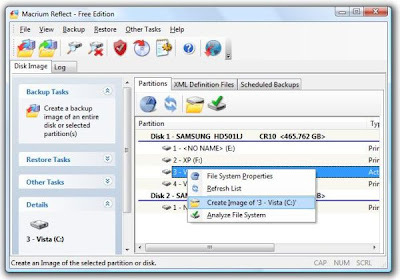 For this step, look to an online backup service like iDrive or MozyHome. Both offer 2GB of free storage and the option to upgrade to unlimited storage for a fee. Mozy relies on client software to help you select both common file types to back up and important user data files for programs like Outlook and Quicken, while iDrive uses an Explorer-style interface for selecting specific files and folders to preserve. The real advantage to both services is that they work automatically and in the background, uploading new and changed files while you work (or at scheduled times). That kind of set-it-and-forget-it backup is well worth a few bucks every month. If you'd rather save your pennies and don't mind taking a more hands-on approach, loads of services let you park files online free of charge. ADrive, for one, offers 50GB of absolutely free storage. However, no synchronization is involved: It's up to you to pick and choose which files to upload, and when. Thus, use these services for files that don't change all that often, like MP3 and photo libraries. These days it's not uncommon to own two or more PCs, and if you have family members under the same roof, they probably have their own machines as well. Why not create a "backup network" that leverages everyone's hard drives? 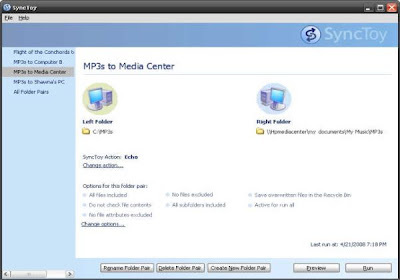 All you need is SyncToy 2.0, one of Microsoft's free PowerToy utilities. With it, you can create "folder pairs" between PCs, copying files between them with a single click. This is a great way to sync, say, disparate photo libraries between your PC and your spouse's, and to create a backup of both in the process. If your PCs aren't on the same network--one is at home and another is at work, for instance--try Microsoft's Windows Live FolderShare, which syncs files across the Internet (and does so automatically; SyncToy requires you to manually resync whenever you change or add files). FolderShare's advantage is that you can expand your backup network to include friends, syncing critical files to their machines and vice-versa. Like SyncToy, FolderShare costs nothing to use. If you're a Google Docs user, you know that this Web-based office suite can import documents from Microsoft Word, Excel, and PowerPoint. But wouldn't it be great if you could actually synchronize those kinds of documents between your PC and the suite? You can with the free tool - OffiSync. It lives directly inside Office, as part of the same overall menu you use for opening files. A new entry, OffiSync, appears there. From here, you can save files to Google Docs, open files from Google Docs, add or remove collaborators to documents, and send a link to a Google Doc document via e-mail. It's exceptionally easy to use. If you're like most users, you've accumulated years' worth of bookmarks in your browser--a collection you definitely don't want to lose. Fortunately, it's a snap to copy those bookmarks to the Web for easy retrieval if the need ever arises. Firefox users should install the free Xmarks plug-in, while Internet Explorer users can accomplish the same thing with BookmarkSync. Incidentally, both tools can also keep your bookmarks in sync across multiple PCs, and both let you access them from any browser. Are you an e-mail packrat? If so, you'd probably be loathe to lose your archives. Start with one of two free backup utilities designed expressly for e-mail: Amic Email Backup, which copies everything--including your address book, account settings, and message rules--to a single compressed file; or Mailstore Home, which duplicates all your mail into a searchable archive and optionally backs it up to CDs or DVDs. 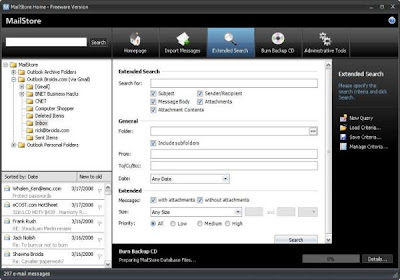 Amic supports nine e-mail clients, including Outlook, Outlook Express, and Eudora. Mailstore Home works with Windows Mail, Outlook, Outlook Express, Thunderbird, and Seamonkey. Of course, unless you put those discs in a safe or upload the archive file to the Web, those kinds of backups are still vulnerable to fires and other local disasters. That's one reason to consider routing your e-mail through Gmail IMAP, which effectively creates a Web-based archive by syncing mail between Google's servers and your PC. Start by signing up for a free Gmail account, then enabling IMAP and following the configuration instructions for your mail client. Then you can either configure your mail account to forward all messages to your Gmail account or set up Gmail's Mail Fetcher to retrieve messages from your ISP's POP3 server. From then on, all of your mail will go through Gmail, giving you more than 6GB of storage space for messages and attachments, and some excellent spam filtering in the bargain. Once you have everything set up, you'll forever have copies of your messages available in your Web-accessible Gmail account. That's not only an ideal e-mail backup, but just plain handy, too. 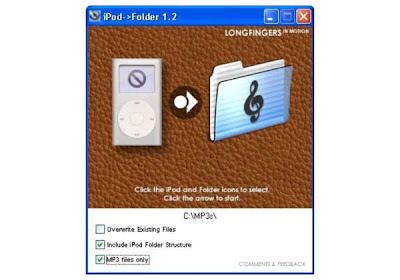 Likewise, if you own an iPod or other media player, you can use it to restore a lost or damaged music library. 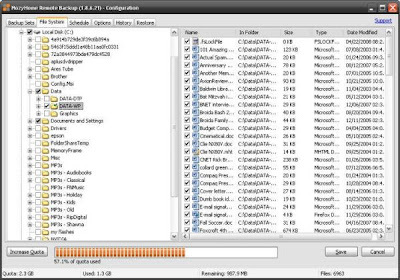 iPod users should check out iPod Folder, which copies music directly from the player to any folder on your Windows and Mac system. You can even store the program on your iPod so it's available on the spot. You can do the same thing with any MP3 player that your PC recognizes as a hard drive. Bookmarked it for any future requirement. And, thanks for such a regularaly updated blog.